In a large bowl, mix flour, baking powder and salt. In a small bowl, beat one tbsp sugar, eggs and butter. Stir in milk. Add milk mixture to flour. If dough is too dry, add a few more drops of milk. Knead dough until it is very smooth. Shape into 20 balls. Cover and let stand for 30 minutes. Heat oil one-inch deep in large skillet to 360 F. Roll each ball out on a lightly-floured board into very thin six-inch circle. 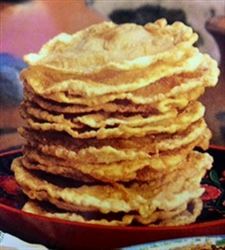 Fry buñuelos until golden brown, turning once. Drain on absorbent towels. Sprinkle with sugar-cinnamon topping while warm, or drizzle with syrup or Miel de Piloncillo. These can be frozen. Wrap separately in freezer bags. Enjoy this delicious bunuelos Mexican food recipe! I came up to find the recipe because I forgot all the items, but I found that you missed something, the syrup is not only piloncillo this has also cinammon and cloves to make them taste better also we don't add butter, only little bit of shortening. The instructions were easy to follow but I personally feel that the 1 TBLS Baking Powder was too much. But while speaking with my mother in law she advised me to roll out the dough and then let them sit for 30 min. Also, she said it was too moist and the dough should be on the dryer end. But all in all, the bunuelos came out delicious. I don't know about authentic, I have had these all my life and being Mexican I am a little stumped as to what makes this recipe authentic. Just saying! it is an okay recipe but lacks that puffiness a real buenuelo has. In a medium bowl, stir together the flour, baking powder, and salt. Stir in milk, and mix until the dough comes together. Add more flour if necessary to be able to handle the dough. On a floured surface, knead the dough until smooth, at least 5 minutes. Let the dough rest for 5 minutes. I really liked this recipe. very good, the first couple i didnt cook enough but the 2nd one and the rest were awesome!!!!! very easy to make, dont be afraid to leave longer, took me awhile adjust the oil but finally got it. Wow I made this recipe for the holidays is easy and super delicious!!! Great recipe!!! First time making them and they came out very good. My mom even liked them and she knows how to make them. One helpful hint, because they are made with butter they burn easily in the pan so toast them quickly. OMG this bonuelos are so good!! !